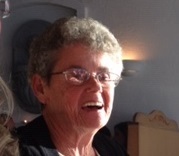 Shirley Creighton - Heritage Funeral Homes Inc.
of Palmerston passed away suddenly at Palmerston and District Hospital on Saturday March 23, 2019 in her 78th year. Beloved wife of Charles Creighton. Dear mother of Brenda (Steve) Garland of Kitchener, Cheryl Ann (Trevor) Hughes of St. Catharines Charles (Meg) Creighton of Angus, and Alfie (Donna) Creighton of Stoney Creek. Loving Grandmother of Kasandra Garland (Ken), Gabriel Garland, Hannah Hughes (Taylor), Dylan Hughes, Disa Creighton, Jonathan Creighton, Angelina Creighton and Breanna Creighton. Great Grandmother of Ian Evans. Sister-in-law of Loreen Dale, Murray Wilson, Phyllis Cosman. David (Patricia) Creighton, Blythe McDowell, Donelda Boomhower, Donald Boomhower and Herbert Boomhower. Fondly remembered by her many nieces, nephews and friends. Predeceased by her parents Walter and Pearl Dale, sister Kathleen Wilson and brother Alfred Dale, sisters-in-law and brothers-in-law William Creighton, Michael Creighton, Leanna Boomhower and Patrick McDowell. The family will receive friends at the Heritage Funeral Home, Palmerston on Wednesday, March 27, 2019 from 2-4 and 6-8 p.m. Rev Pirie Mitchell will conduct the Funeral Service of Remembrance in Palmerston United Church on Thursday March 28, 2019 at 2:00 p.m.
As expressions of sympathy donations to Palmerston Hospital Foundation, Palmerston United Church or the Canadian Cancer Society would be appreciated by the family.